This Moen 82403 Adler 3-Handle Tub & Shower Bath Faucet is finished in chrome to create a bright, highly reflective, cool grey metallic look. Get just the amount of water you want with its 3/4 inch volume control valve. It includes a 4" diameter Easy Clean XL single function shower head. 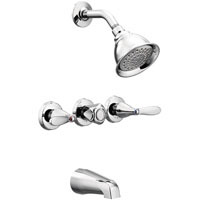 Features a 4 7/8" tub spout length, lever design for ease of use and 1/2" IPS connection and is ADA compliant.